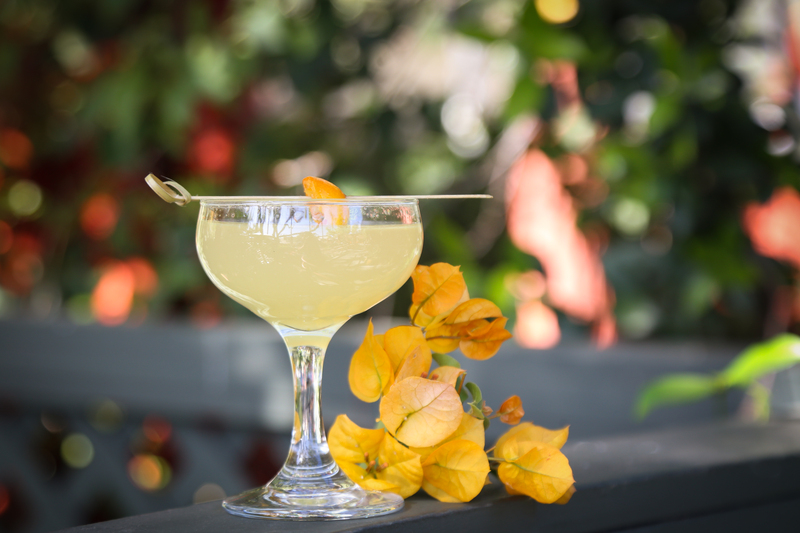 Since Alcove opened its doors 14 years ago, the sunny Los Feliz cafe that’s been the venue for an untold number of weekend patio brunches has gradually evolved into a local gem. It’s become known for display windows jam-packed with pastries, crushable cocktails served out of its own Big Bar, and a reputation for throwing some of the neighborhood’s most elaborate and fun parties. Now, with an executive chef at the helm for the first time ever, Alcove is in the process of writing its next chapter. Alcove’s new chef, Matt Sieger, has worked at lauded restaurants, including the Bay Area’s Village Pub, which received a Michelin star while he was the executive sous chef. But that doesn’t mean that he’s planning on transforming Alcove into something it’s not. At the moment, Sieger is making slight tweaks and improvements to Alcove’s tried-and-true, order-at-the-counter dishes, and adding a new seasonal dinner menu on weekends. Along with it comes the option of getting table service. Trellis references Sieger’s roasted Jidori chicken as something that’s “very homey, warm, and comforting, which reflects who we are at Alcove.” For Sieger’s summer menu, which will be launching in the coming week, his roasted chicken rests on an heirloom tomato panzanella salad, a replacement for the mushroom barley porridge he’s been offering since spring. 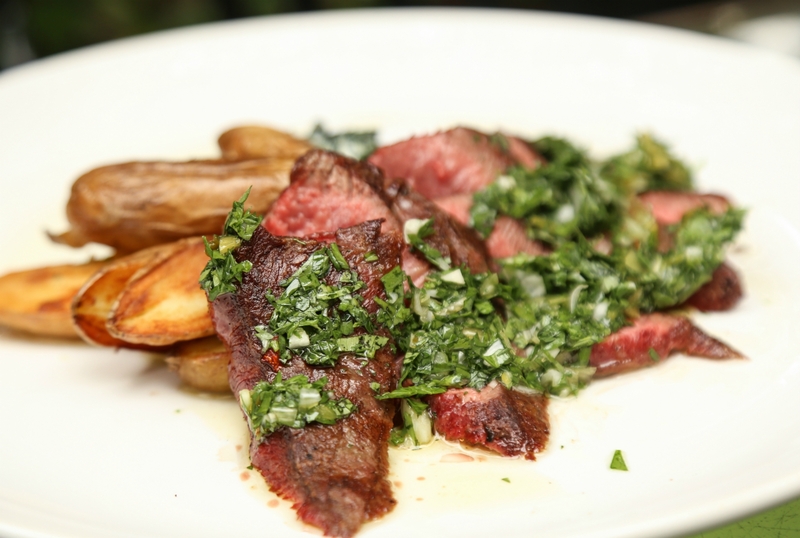 Sieger also serves up dishes like grilled, sliced flat iron steak topped with a green-garlic chimichurri, and lamb kofta meatballs complemented by a mint-yogurt puree. Sieger always thought that he was going to stay in the fine-dining scene, but after he left San Francisco because it was “changing a lot and everything was getting ridiculous up there,” he says, he and his wife moved down to L.A. and opened a kosher Jewish-Mexican taco truck called Holy Frijoles. When they had a baby and closed their business, he realized that he could no longer do the 60-to-70-hour-a-week grinds that are common in the fine-dining kitchens. Then he found Alcove and saw something special in the cafe and team there. Before Trellis opened Alcove in 2004, he hadn’t had any prior restaurant experience and was working as a human resources executive in the retail industry. It wasn’t until he met his now-husband Mark Gunsky, who owns Aroma Coffee & Tea Company in Studio City, that he was inspired to launch a cafe of his own. The property Alcove now occupies on Hillhurst Avenue was a lot different back in the day. The lot had two historic bungalows—one built in 1897 and the other in 1916—with a big grassy lawn out front. Trellis says it had previously been used as an escrow office and before that, a school. He attempted to remodel the bungalows to what he imagines they looked like when they were first built. When he took down the front bungalow’s interior walls, he left two alcoves standing and named his cafe after them. 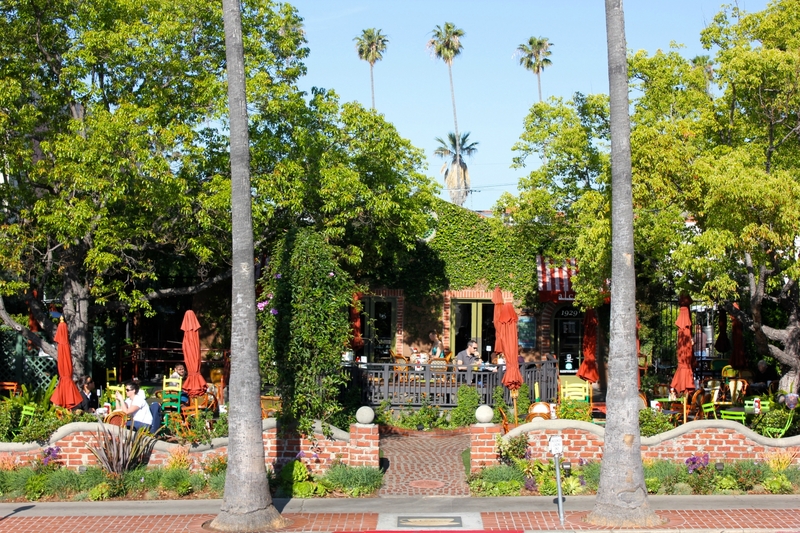 Today, Alcove’s cafe shares the front bungalow space with it’s cocktail joint Big Bar. The 1897 cottage out back is used for private events, and the buildings are surrounded by three gorgeous garden patios with trees that twinkle with warm, yellow lights at night. What hasn’t really changed is that Alcove has always served sweets, from whoopie pies to layer cakes and cupcakes that it sources from about a dozen offsite bakers. In 2009, Trellis started his own chocolate company, Alcove Chocolate, and he currently sells his creations at both Alcove and Aroma Coffee & Tea. The classics on the menu at Alcove include items that have been years in the making—and all without an executive chef. Trellis says it was a collaborative effort from all staff, including line cooks, general managers, servers, kitchen managers, and himself. These synergistic efforts have partly been made possible by the fact that Alcove has had a long history of employee retention. Many of its staff members have been with the company for more than a decade, which isn’t common in a transient industry. Eugene Lee, who’s worked at Alcove and Big Bar for 11 years, has worn many hats throughout his tenure there. Nowadays, his title is digital director, but he’s also the house photographer, events producer, publicist, and even Big Bar’s bowling team captain. Lee’s first job at Alcove was being a barista, and Mark Foster of the indie pop band Foster the People trained him to make coffee and lattes there. Some of Alcove and Big Bar’s longest standing employees are creatives who also happen to be actors and musicians. When Lee had to leave Alcove at times to pursue acting work in Singapore, he says it was comforting to know that he always had a home at the restaurant. “It’s nice to be able to go and have a place be supportive of your artistic endeavors and opportunities, but always be able to come back to it,” Lee says. They also promote from within. Mario Tecuapacho, who’s been at the company for ten years, started off as a dishwasher, and worked his way from busser to bar back, and is now a bartender. In 2010, Big Bar, a 325-foot-bar with an ironic name, was born. Its current bar manager, Cari Hah (formerly Clifton’s, The Varnish, Three Clubs), has been running the joint since 2015. Under her supervision, Big Bar has been receiving some notable attention. For two years in a row, Time Out Los Angeles gave Big Bar the Best Bar Team and Family awards, and earlier this year, the Daily Meal named it was one of the 150 Best Bars in America. When Lee first approached Hah to join the Big Bar team, she was a little hesitant to take on the role as bar manager because she was enjoying her time doing freelance gigs in the cocktail industry. Like Sieger, Hah made the jump partly because of the team’s ethos. With Big Bar’s Anna Wintour-inspired, “Banana Wintour” cocktail, a take on the Ramos Gin Fizz, it’s made with Jack Daniels rye, Tempus Fugit Crème de Cacao and Crème de Banane, a caramelized banana liqueur. The libation is amusingly garnished with an edible mini sugar-printed Vogue magazine cover and sunglasses attached to a straw. There are other fun drinks like “Pushing Daises” that’s served in an Absolut Elyx copper garden gnome cup and sits on a patch of Astroturf grass with a daisy poking out of it. 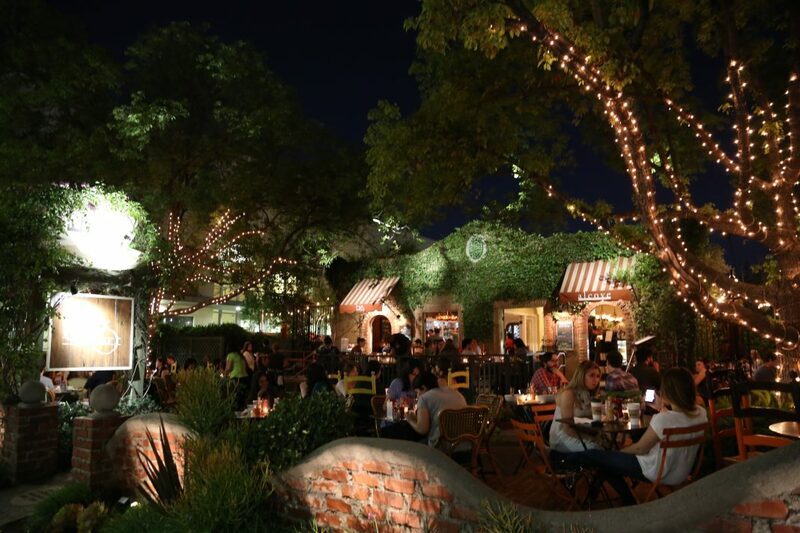 Over the years, Big Bar has become known for throwing neighborhood events, like its annual New Year’s Eve party and sprintime garden gala. At this year’s event in April, the team created five different experiences with unique cocktails, from a silent disco to a boozy tea party and Hawaiian garden. Even with all these events and the changes Trellis has made over the years, he’s still isn’t done with transforming Alcove and Big Bar. He likens his never-ending improvements to a painting that’s never completed, where’s he’s always slathering on some new paint. “There’s always next steps—nothing’s that’s truly well-baked yet—but stay tuned for more,” Trellis says and laughs.